One unfortunate rider got a surprise dunking at Appleby Horse Fair, when her horse launched itself off a ramp into the River Eden. The cob took a leap of faith into the river as it attempted to follow it's friends lead into the water. Both horse and rider walked away wet, but unharmed. The RSPCA is asking people attending Appleby Horse Fair to leave their dogs at home. It comes after two dogs had to be rescued on Saturday when their owners realised it was not a suitable event for them. The dogs could also scare the horses, which in turn could endanger the public. "Do not bring dogs to the Fair. Dogs can result in hoses becoming “spooked”, which makes their behaviour unpredictable and can lead to injuries. Organisers of the Appleby Horse Fair have closed the river ramp due to high river levels. The Jubilee Ford is used for horse washing, but it will be closed overnight with immediate effect until tomorrow morning due to high waters levels and quickening water flow. Officials say that the safety of animals and the wider public is the primary concern for these measures being put in place. “Following a meeting this afternoon of the Multi Agency Strategic Co-ordinating Group for Appleby Fair (MASCG), we have taken the decision with the support of MASCG Gypsy and Traveller representatives, to close the River Ramp on the Sands and the Jubilee Ford that are used for horse washing. "The river’s high water level could pose a risk to animals and the public. The closure will remain in place overnight until tomorrow morning." Barriers preventing entry into River Eden will be removed by 4pm today, Wednesday 7 June. The Multi-Agency Strategic Co-ordinating Group (MASCG) say it is due to the river levels reducing below 0.5m and the RSPCA being able to clear most of the debris. Travellers and visitors are still being warned to only enter the river at their own risk, as additional debris may be found in the river later in the day. The MASCG say they will continue monitoring the rainfall over the next 24 hours. The ramp used for washing horses in the River Eden during the Appleby Fair has been closed, because of the rising water level. Heavy rainfall in the Appleby area means the river level has risen, and the Multi Agency Strategic Co-ordinating Group of public agencies and Gypsy and Traveller representatives has decided it could put people and animals at risk. The water level is being continuously monitored and the group will meet again tomorrow to review the situation, ahead of the start of Appleby Horse Fair on Thursday 8 June. Public safety and animal welfare is always of paramount concern at Appleby Horse Fair. Due to the heavy rainfall Appleby has experienced over the past 24 hours, MASCG has been advised that in line with our safety policy it is in the best interest of public safety to close the ramp at the river for the time being. We will review this situation tomorrow and provide a further update. Local authorities co-ordinating this year's Appleby Horse Fair say planning to ensure the safety of visitors and residents are going as planned. Many travellers are staying at designated stopping places ahead of the fair, which starts on Thursday, 4 June. 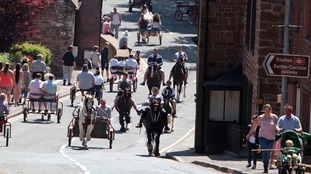 Up to 40,000 travellers are expected to descend into Appleby this week for the week-long annual Appleby Horse Fair. Here's a list of road closures and speed restrictions that will be in place over the event. An event will be held where local residents in South Lakeland can learn more about arrangements for this year's Appleby Horse Fair, and share any concerns or ideas. The fair will be running from the 8th to the 14th of June and attracts up to 40,000 visitors. The pre-fair drop-in meeting will be held on Wednesday 17th of May, at Barbon Village Hall from 4-6pm. South Lakeland District Council say they will work with local authorities and to manage the migration of Travellers to and from the fair. Temporary stopping point sites will also be organised for traditional and motorised caravans. Through our arrangements leading up to, during and after the fair we want to ensure the movement of Gypsies and Travellers through the district is safe and enjoyable for everyone and to reduce the impact on the environment. Anyone who cannot make the drop-in meeting but would like to raise any issues can contact SLDC’s streetcare team by emailing: info@southlakeland.gov.uk or calling 01539 733333.